The first hurdle for some is simply understanding the concept that the ski is rarely going where it is pointed. In fact, it’s virtually always sliding sideways to some degree. The only exception is during a brief instant while the ski rolls through running flat on the water during the edge-change. Otherwise, the ski is either drifting wide from centrifugal force while turning, or being dragged sideways down the lake during the tug-of-war with the boat. Drift is infinitesimally small on either side of the edge-change, and gets more significant everywhere else, with maximum smear occurring during the turn around the ball. Spray is displaced water, so wherever there is more spray on one side of the ski than the other, the ski is side-slipping. And wherever the ski is slipping sideways, this slip can be managed with binding and fin settings. The ability to adjust smear is a big part of tuning ski behavior during the cut, pre-turn, and most significantly, around the ball. 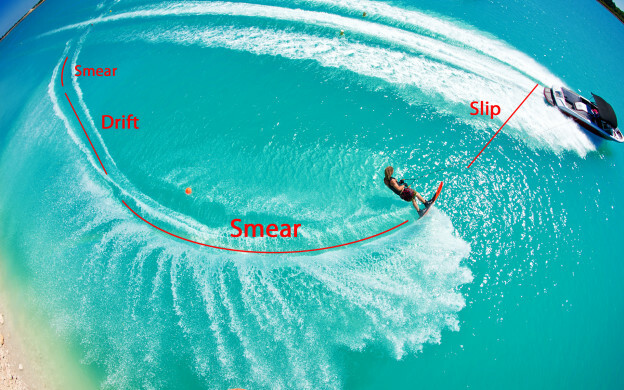 Generally speaking, smear is just a synonym for drift, slide, side-slip, and the like, although each of these terms may have subtle differences. 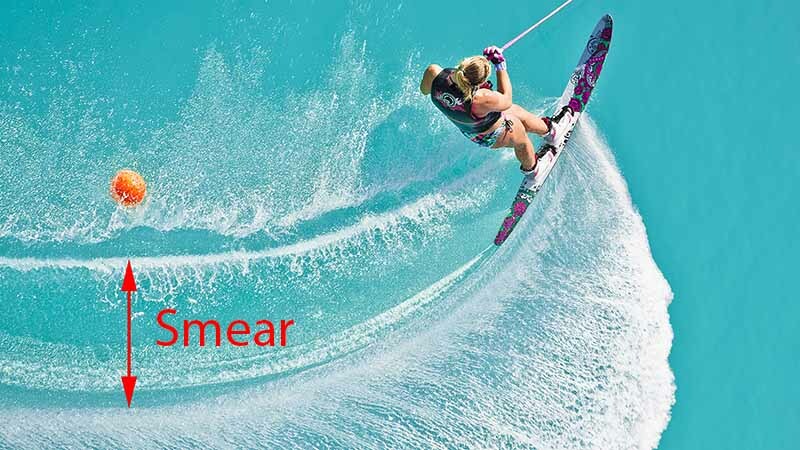 One differentiating aspect of smear is that it’s the component of a ski turn that isn’t controlled by the rocker of the ski. The rocker defines the carving component of a turn, and the way the tail drifts wide around a turn can be referred to as smear. This means smear could be differentiated from drift or slip by its rotational component. This picture shows how the tail of KC Wilson’s ski has drifted wider around the ball than the tip of the ski. Smear is the rotational component of this drift. The terms drift and slip are probably completely interchangeable. In this picture I differentiated them only to suggest there is a slight difference between drifting wider due to centrifugal force and slipping sideways while being dragged down the lake behind the boat. 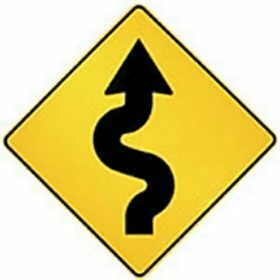 Both of these side-slipping events are in a relative straight line with very little change in direction or ski rotation. I’ve used smear to label everything that also has a clear rotational component involved. I don’t think using these terms to describe the way the ski slides in these three segments of the pass is carved in stone, but there is a tidy fit. What’s most important about this emerging term is that we understand where and how much the tail of the ski smears, how this smear is affected by skiing technique, and how to fine-tune it with binding and fin adjustments.